Groupon redemption is now closed, please bring your voucher (printed OR on mobile) with you to the event for festival admission. Tickets are available for $12. A DD ticket holder will get a bottle of water. 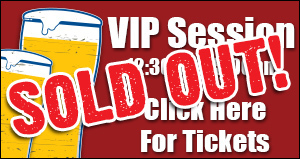 Designated drivers do NOT receive a wristband or a tasting glass and are NOT permitted to sample any beer. Any designated driver seen drinking will be removed from the festival immediately. Designated drivers must be 21+ and present valid photo ID for entry. Everyone who purchases a ticket will get in. No tickets will be sold once the event sells out. 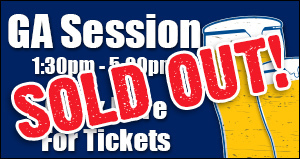 We have limited the number of attendees to insure that everyone that purchases a ticket will be able to sample the beers they want and move around with ease. The event will take place rain or shine. All Attendees must show valid photo I.D at the door to be admitted. You must be 21 or older to attend this event. No Exceptions! No children, toddlers, infants, strollers, or pets are permitted. All ticket purchases are final sale, no refunds or exchanges. Tickets purchased from an unauthorized source may be lost, stolen, counterfeit or in violation of resale policies and if so, are VOID, and you will be denied entry. We strongly discourage you from purchasing tickets from an unauthorized source. Tickets purchased from sources other than this website may not be valid and may result in attendee being refused admission to the event. Purchasing a ticket from an unauthorized seller is not advised. The event producers are not responsible for honoring invalid tickets nor issuing any refunds for invalid tickets. Look for our event photographer at the event and strike a pose. Check back here, at this website, and on the event's Facebook page after the event to see if you are included in the event photo album. Some photos of attendees may be used for promotional purposes; as a ticketholder of the event, you grant us permission to do so and for your likeness to be used.